Atlanta-based photographer Anderson Scott has now published his book Whistling Dixie, featuring his photographs of Confederate re-enactors at war and at play. He's been photographing these folks in the field for some time now, as well as hanging out with them around the encampments and attending the Jefferson Davis Birthday Parties and all the other attendant activities these folks get up to in the pursuit of their fantasy that the South won (or should have won) -- the Civil War. Robert Hinton, a native of Raleigh and a professor of history and Africana Studies at NYU, says of events like this that he doesn't care if people refight the Civil War, so long as the outcome remains the same. The folks in Scott's photographs keep hoping that if they keep up their fantasy play, one day they will change the outcome. 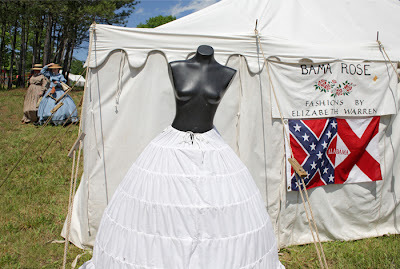 Scott was quoted in SxSE magazine a while back, when they published a portfolio of these photographs, to the effect that "At the reenactment, I found a population that seriously believed that this world would have been a better place had the South won. "I also learned that this population routinely acts out its beliefs in elaborate alternate-reality events, not just reenactments, but also many other public and private functions. 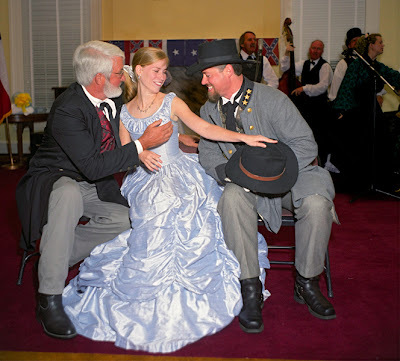 "These events seem to combine political magical thinking (“If I wish hard enough, the Confederacy will return”) and personal magical thinking (“Here at the reenactment I am the dashing Confederate officer I rightfully should be, rather than the functionary that I am at work”)." You can read a really thoughtful interview with Scott here, on Wired. Scott's book is an important look into the alternative world in which the re-enactors live. 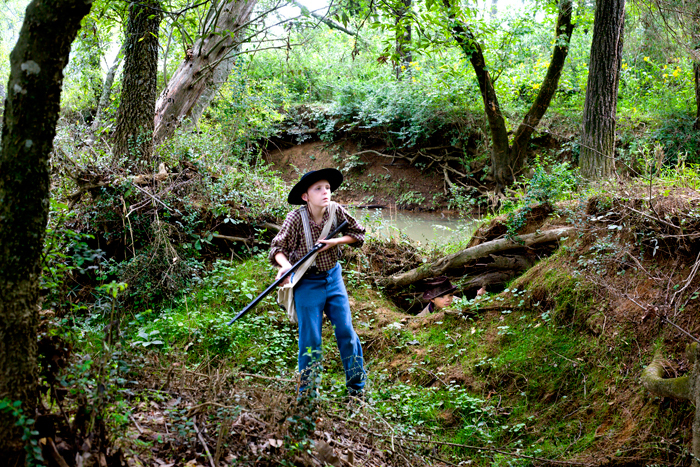 It's also a look into the contradictory moral world that some Southerners have gotten themselves into since the Civil War. This is a world of make-believe, a world as phony as these re-enactments, a world where the Civil War wasn't the Civil War, but the War Between the States, and it wasn't about slavery at all, but about states' rights. Somebody once noted that ignorance and stupidity are two different concepts that often get confused. Ignorance is a condition that can be alleviated by education, but stupidity is a commitment. These folks are making that commitment. There is a new book out called The New Mind of the South, by Tracy Thompson, another Southerner who will have none of this nonsense. Thompson takes a long, hard look at these folks in her book. You can get the flavor of her argument here. There is an interview with Thompson about her book, from the NY Times, here. I will confess that I am as much a Southerner as anyone can be. My family has lived in the South since we came here from England and Scotland and Ireland. My ancestor John Wall moved to North Carolina from Virginia in about 1750. All my ancestors are Southern, I'm descended from slave-owners on both sides of my family, and at least two of my ancestors were killed by Sherman's soldiers on their way north after burning Atlanta. And I know that when my ancestors went to war in 1861, a war that wreaked havoc on the South, a war that resulted in the deaths of over half a million Americans, they went to war for one reason, and one reason only, to preserve a legal, social, and economic system based on slave labor. But, as someone once said, the tragedy of being black in the South is that you can never forget slavery. The tragedy of being white is that you can forget slavery. Scott in these images has nailed the look and the attitudes of folks who have forgotten the moral enormity of what my ancestors were up to in the Civil War. Or who know -- as many of the folks did, back in the early 1800's -- that slavery was wrong, that our ancestors were wrong, and who choose to play games with time, with history, with other peoples' lives and histories. They are able to pretend to be Confederates without confronting the violence and the cruelty and degradation that my ancestors were capable of inflicting on other human beings. Scott's images suggest other kinds of magical thinking going on among these folks as well. Like the thoughts running through the heads of the two old guys in the image above who are taking exceptionally un-paternal interest in the young blond woman sitting between them. The wonder of Scott's work is in the fact that there are shots like the one at the top of this blog entry, in which he captured the look on the face of the young woman in the right foreground of that image. My guess is, she's asking herself how the hell did she let herself get dressed up in this silly dress and sitting on a toe-sack in front of that mean-looking white woman and that flag, and just when a photographer walked by. This work represents, to me, a powerful send-up of Old South iconography, combined with deep compassion for its sad, desperate fans. As I've said before on this blog, Scott's perhaps most truthful image in this book is this one, of a frightened and pathetic little boy alone in the woods, with only his way-too-big gun to help him feel safe. That gun would kill him if he ever had to fire it, but for the moment he's safe in his sad fantasy that his gun makes him a real man. In contrast, here's an authentic Southerner's response to the reality of slavery and its aftermath. Robert Hinton of NYU makes the comment I quoted at the top of this blog entry in a wonderful documentary film called Moving Midway, about the effort to preserve a Southern ante-bellum mansion from the onslaught of shopping centers and strip malls. To preserve it, the owners choose to move it. In the process, they learn about, and meet, their extended family of relatives and descendants, black and white. Along the way, lives and understandings get changed. Hinton, for example, says, early in the movie that as far as he is concerned they can tear the house down and pave over it. The house is a sign to him of the institution of slavery, and of all the pain and suffering of his forebears. Honesty, appreciation, candor, integrity, respect, dignity -- that's what we need when we look back, and when we look forward, as Southerners. Anderson Scott is to be congratulated on this fine, painful, and strong book of photographs. It is a considerable achievement, a deep and thoughtful body of work, for which we owe him a great debt of gratitude. You can read more about Scott's book here, from Arts Atlanta. Springtime in the South -- Scene Heating Up!